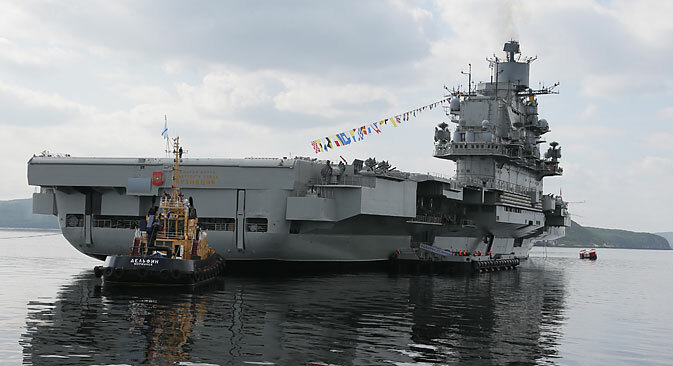 Russia will have an aircraft carrier, Admiral Igor Kasatonov, Deputy Commander of the Russian Navy, announced recently. The construction of the aircraft carrier will only begin after 2025. Historically, the Russian Navy has served as an auxiliary tool for the world's most powerful army. The advent of nuclear submarines in the second half of the 20thcentury added the function of strategic deterrence to the navy. In order to protect the areas of deployment of its strategic submarines and with a view to actively participate in numerous conflicts in the Third World countries, the USSR began constructing helicopter cruisers in the 60s, followed by heavy aircraft carrying cruisers (TARK) in the 70s. Unlike the US ones, the Soviet aircraft carriers were partially self-protective, as the Soviet Navy possessed neither forces nor means for the formation of powerful AUG, like that of the United States. The price to pay for the installation of arms was a decreased number of aircrafts and a catapult, which was the only way to lift the AWACS aircraft off the deck. Today, the carrier is needed for the accomplishment of all the same tasks as in the USSR, and in many ways its creation will be related to modernisation and further deployment of the naval component of the Strategic Missile Forces. Currently, half a dozen of Soviet-built Su-33 based on the TARK Admiral Kuznetsovare undergoing modernisation, and the new MiG-29K are being purchased. Carrier-based aircraft of the fifth generation is expected to be created in the near future. While in case of the aircraft things are not looking too bad, the construction of new floating airfields for them has been constantly postponed since the early 2000s. The closest Russia has reached is the creation of the prototype model, which was recently presented in the Krylov State Research Center (reference link). The new atomic aircraft carrier(unlike Admiral Kuznetsov), which will carry about 100 aircraft, is programmed to have a catapult installed along with jumps. Events in Ukraine and the clash with the West spurred the slow-motion plans of Russian government to go ahead with constructing heavy warships. Kasatonov has noted that Russia would gain the experience in the construction and operation of modern large ships while realising the project of the ocean-going destroyer ship Leader, which would become the theoretical basis and the foundation for the construction of an aircraft carrier. The state armaments programme up to 2020 does not provide for the construction of an aircraft carrier. But the industry is preparing for such an order and this conclusion is not derived merely from the prototype model demonstration. In mid-February, the chief of naval aviation of the Russian Navy, Major General Igor Kozhin, said that technically everything is ready and the aircraft carrier may be built in 8-10 years. The question that remains open is the construction site location for the new aircraft carrier's body, since Nikolaev shipyard, where the Soviet TARKs were traditionally built, is now in Ukraine. Most experts believe that the construction of a new ship of this class can begin only after the completion of the currently running reconstruction of the inlet basin of Sevmash factory, the site where a whole queue for modernisation has already formed. After the annexation of Crimea by Russia, another candidate for the construction of an aircraft carrier can become Kerch factory Zaliv (Bay), which used to have the largest dock in the USSR. The head of the Republic of Crimea, Sergey Aksenov, specifically mentioned this possibility. In the coming years the Russian fleet will be focused on is protecting its own shores and recreating the naval aviation that had been nearly lost in the 90s. Aircraft carriers will be the next stage of development. This time, the announced timing of the construction of aircraft carriers looks quite realistic, and the emergence of a series of frigates and destroyers by that time will help create appropriate outposts.